Apple unveiled an array of new products in its spring special event at Apple headquarters in Cupertino, California, on March 21, 2016. Apples most anticipated highlights were the new 4-inch iPhone SE and a new 9.7-inch iPad Pro. 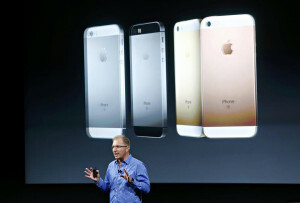 Apple Vice President Greg Apple VP Greg Joswiak introduces the iPhone SE during an event at the Apple headquarters in Cupertino, California on March 21, 2016. The phone has a 12 megapixel camera and enhanced security features.